Starved for storage? 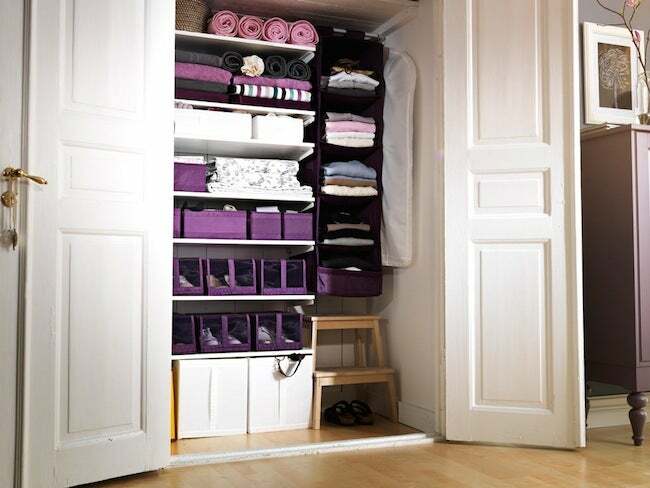 You can make the most of every inch in your small closets with these simple yet smart solutions. A big walk-in closet is a luxury that some people can only dream of, especially if they live in an older home. Homes built more than 50 years or so ago tend to have modest closets and short of a major remodeling project, you may be stuck with what you’ve got. But there are ways to make the most of every square inch. Your first task is to clear out items you don’t use regularly—you may be surprised at how much space that creates. Then start hunting for extra space. The back of the door is a great place to start. Instead of just a hook or two, consider installing a shoe rack or other organizer on the back of your closet door. Use the whole height of the door, top to bottom. Then turn your attention to the shelf—most shelves have three or four inches of unused space below them, where you can slip in an under-shelf wire basket. Finally, check the floor. If yours is a jumble of shoes, clothes, and clutter, you’re wasting precious space. Once those shoes are in a rack and the clutter moved into new baskets, you may be able to fit more shelves or even a small chest of drawers in there.